Sure, my ticker counter says 506 days left 'til the big day, and its still "so far away", right? Today for the first time ever... i put a veil on my head...Unfortunately, I didn't take any pictures... I was probably overwhelmed with the crazy set of emotions that came upon me!!! It was such a weird feeling... like it started to sink in more. Like i got all nervous and tingly. My stomach started to do flips......O M G!!! I am getting fricking married!!!! !! !OMG OMG OMG OMG OMG OMG OMG!!! It's one of those things that seems to come and go. I have a funny feeling it won't really sink in til I'm standing at the altar. I'd say a good OMG. LOL. 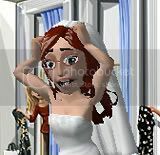 Thats what I did when I put on the wedding dress i tried on that i knew what the dress. i was like OMG. LOL. hey i tagged Ms BBQ and you. I just forgot to post your blog too. LOL. But I fixed that. And i did leave a comment for her too! 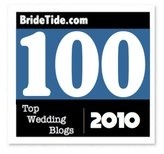 I'm the same as Introverted Bride... it probably won't sink in until I'm up there that day! Up until then I feel like I'm playing dress-up! Oooooh. I wish you'd taken a pic! You'll have moments like this. I love it when my FH introduces me as "his future wife." It makes me all tingly inside. 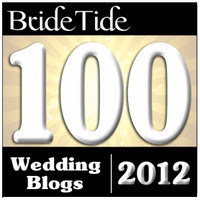 I wasn't into dress shopping (as you know,) but when they put that veil on with the dress that was "the one" - WOWSA!!! I could imagine. Right now, your just plannig. That's the easy, unattached part. Trying on dresses and veils is the real part. I totally understand.